Join us during 2018 Fall Welcome Week! 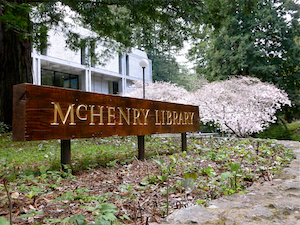 You will also learn about important library services such as Course Reserves for your classes, borrowing Chromebooks, expert research help, and the Interlibrary Loan service that can bring the world's library resources to you! New students: While you're here, take a minute to activate your library card (it's the same as your UCSC student ID). Tours run approximately 15–20 minutes. Join us and get to know your University Library!